Please keep in mind that when climbing an active volcano changes in activity and weather may cancel or cut the excursion short at anytime. Medical and Legal Note: Guests booking this tour certify that they are in excellent physical condition and free from any heart, respiratory and/or back condition and are not pregnant. Booking of this tour constitutes an acceptance of the inherent risk of climbing any active volcano and the guest agrees to hold Gray Line all subsidiaries, licensees, staff members and vendors harmless and not liable for any and all injuries or death as a result of taking this tour. If you are lodging in Zone 1, our only pick-up point is at the Hotel Panamerican. If you are lodging in an airbnb please move to the nearest hotel lobby and please let us know of its name. Tours include bilingual guide (English and Spanish). It is recommended that you bring walking shoes, hat, sunglasses, a windbreacker jacket, a scarf and a camera. Child under 13 years is not allowed to take the thermal circuit. Please contact us if you need a guide in any other language. French, German and Italian in private services, subject to additional costs and guide availability. This day you will visit the Pacaya National Park. Visit to the most active volcano in Guatemala, its 2500 m. above the sea; the environment is formed by humid forest and rocks. Transfer to the foot of the Pacaya volcano and from there, we started walking from the town of San Vicente de Pacaya and we started the ascent; The route is estimated at 60 minutes of walking up to a distance of approximately 800 to 1000 meters from the crater. 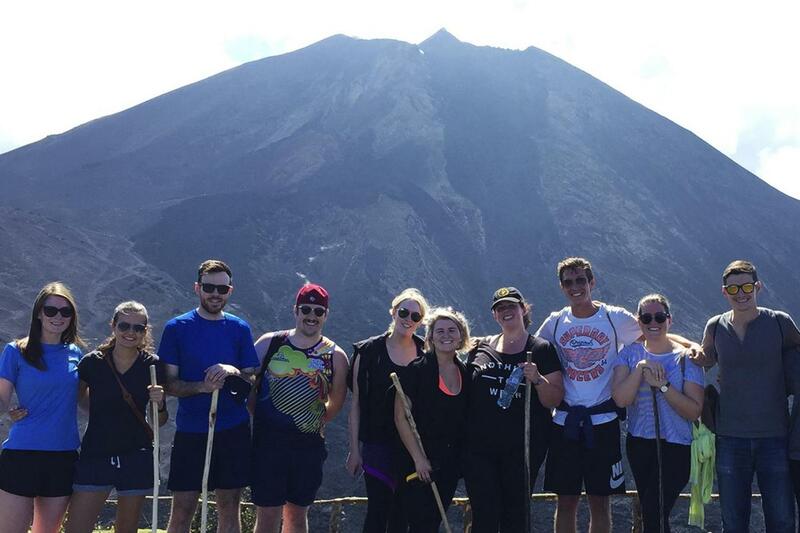 You can appreciate the valley view of Guatemala City, enjoy the heat of the volcanic stones and if the weather allows you to experience the adventure of roasting marshmallows with energy from an active volcano. The Pacaya volcano is still one of Guatemala's active volcanoes. At the end of our walk we will reach a rocky and arid area where we can see the volcano and lava flows, where we can cook marshmallows. Time to take souvenir photographs. We will begin our descent and during our journey we will find the Lava Store where you can buy a souvenir made with volcanic material and with your purchase you will be able to support the community. Please note: For safety reasons, and in compliance with rules issued by the Pacaya National Park, the closest guests can get to the volcano’s crater is approximately 1km, and will only see the crater from afar. After the visit and explored of the Pacaya Volcano we continue to Kawilal Hot Springs to have time to take lunch ( Included ). Kawilal is a world of relaxation, where the most important elements of nature are present in this unique place of hot springs, in our environment are mixed fire and heat from Pacaya Volcano who gives us the thermal waters and steams. Has a complex that promotes sustainable tourism in our country, and has 12 thermal pools, Thermal Circuit, 25 Steam Baths, and 3 Hydrotherapy Baths. The spa offers Relaxing Massages, Reflexology, Shiatsu Relaxing, Manicure and Pedicure among others, within our facilities are also Fonda Del Castillo, a restaurant with international with fast food service. The tour guides are expecting your tips. Do it! You won’t regret it, get a horse if you need but this is a must do! Everything was great, tour guides were great, pick up on drop off were on time, ride was comfortable, Hike was a good difficulty level. short but challenging. scenery was beautiful. and the combo of hike then hot springs was perfect. It was so nice to see the volcano in the view as you enjoyed the thermal spa.Highly recommend if your in the area. Especially if your looking to get away from the busy city for a day. No surprises. Steep Rocky but doable hike with great reward at summit. We were even given marshmallows to roast in the heat coming off the volcano. Lunch stop after was at very nice resort...tasty food included non alcoholic drink and later I was brought a smoothie. It was amazing! I highly recommend this service to anyone traveling to Guatemala. I booked both the Tikal tour by air and the Volcano Pacaya tour with hot springs. Both were very worth it. They catered to my ever need.